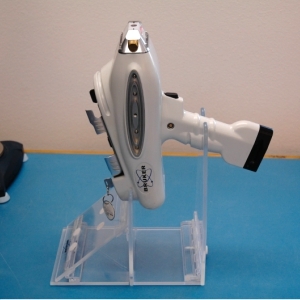 XRF (X-Ray Fluorescence) instruments analyze the elemental content of a material through the emission of x-rays and the measurement of the energy released from the atom. When the instrument’s x-ray tube is activated it emits x-rays that strike the inner shell electrons and ejects them from the atom. An electron from an outer shell of the atom then replaces the ejected one, releasing energy in the form of an x-ray photon which hits a detector on the instrument. This energy is then sent from the detector to a digital pulse processor and then to the computer where it is transformed from counts per channel to spectra and quantitative data. 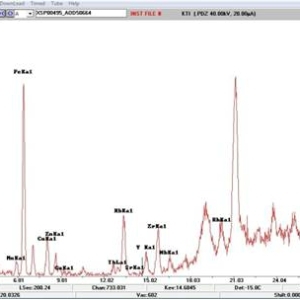 Because each photon has an energy that is unique to the element from which it was released the spectra displayed on the computer can accurately display the elemental make-up of the material being analyzed based on the energy read by the instrument (Bruker Elemental User Guide 2010). NLURA uses a Bruker Tracer III-SD with a rhodium tube and accompanying PXRF and ARTAX software for analysis. 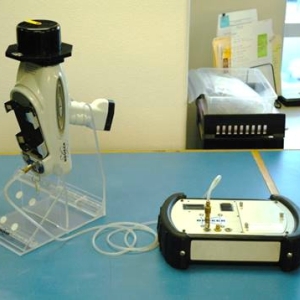 XRF instruments can be used to analyze the chemical components of any object. Its most common uses in archaeology are to analyze soils, metals, glass, and lithic materials and probably most commonly, to preliminarily source obsidian. is often used in obsidian sourcing analysis. NLURA has used its instrument to source obsidian artifacts on several different projects. We have done some preliminary work with sourcing cherts. Recently we have utilized it to analyze column samples of sediment taken from potential house and cache pit features to help determine whether they are natural vs. culturally modified.